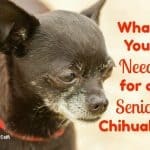 I have seriously been thinking about getting a dog stroller for Kilo lately and thought I’d share my research about them with you! 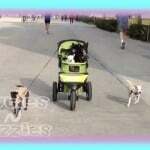 Pet strollers are not just for old or disabled dogs. 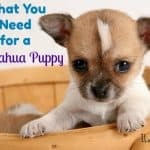 They are also great for puppies, or for any small dog when you are on vacation and are doing a lot of walking. This is the best seller over at Amazon for pet strollers. It’s big enough for several dogs, folds easily and comes with cup holders and a storage basket. You can set your dog into the stroller from the front or the back. I love the animal print fabric. I like that this stroller comes in a lot of colors so you are sure to find a color that you like. This stroller boasts that it opens within 5 seconds. It has a front and rear ventilation window and front and rear entry. It also has a nice storage basket and cup holders. Customers love the sturdiness of this stroller. The storage basket is zippered for security. There is also a tray and cup holders too. The handle is ergonomically designed. The coolest thing is the Smart Canopy . It opens up when you want it to for more space. This stroller has a lot going for it for the price. It’s sturdy, folds easily, has front and rear entry, a storage basket and cup holders and a mesh window. This stroller only had positive reviews on Amazon. This beautiful, sturdy and lightweight stroller does need to be assembled. It has seat belts, several mesh windows, a large storage basket, cup holders and a storage tray, security brakes, removable covers and 360 degree rotating wheels for easy turns. If you are a jogger, then this a great option for you. It’s very sturdy but easy to push. I wasn’t sure what the weight limit was as it said 75 pounds in one section of the page and 25 pounds in another section. However one of the owners said in the review that she uses it for her 70 pound dog with no problem. It folds and stores easily, has a bike attachment, 3 tether clips, a removable pad, a flag, a wind and rain cover.It also has a sun roof, reflective side strips, a rear storage pocket, swivel front wheels, front and rear zip entry. It’s water repellent and has mesh windows. This is one of the lowest priced strollers available at under $30. It’s water resistant, has a nice fleece pad, cup holders and a large storage basket, front and rear ventilation mesh windows, and front and rear entry top. This stroller has a large storage basket, a tray, waterproof liner, a large mesh window, a tether to a attach harness, a fleece pad with waterproof liner, and shock absorbers. Such a pretty blue color, isn’t it? It has dual drink holders and a center tray, opens and closes very easily, front and back mesh windows, a large storage basket, three zippered access points, and a padded foam bottom. Great for jogging, this stroller boasts of a elevated paw rest and a panoramic view window, it’s water resistant, has a large storage basket, no zip technology, a plush pad, air tides and is safe for up to 70 pounds of weight. Well that’s it for our favorite strollers. Do you have a favorite stroller? Or one you would not recommend? Let us know in the comments. Thanks Sky! That means alot to me! Hi I having been researching these for awhile as well and love that my top two choices are on your list #1 & #4. I cant decide between the two. 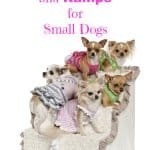 I need one for my yorkie as she is losing some of her sight. Did you end up buying one and did you like it? I have #1 in my shopping cart at Amazon, just haven’t had the money yet to buy it. I have to admit I picked #1 because I love the leopard print. When you get yours in, come back and let me know how you like it Angela. I love my stroller for Wynston, and he loves it too! I bought it almost 2 years ago now and it was well worth the money. I use it for every pet event I attend and for his photo shoots 🙂 The brand is Best Pet. Does Khloe sit in the stroller too Amanda? I use this type of stroller for Toby without the hood . He hates the hood becacause he can’t see me. It has a basket underneath. Ithe actual bag part lifts out and can be used to carry him or a car seat. The frame folds very easy . That’s a nice one Debra! 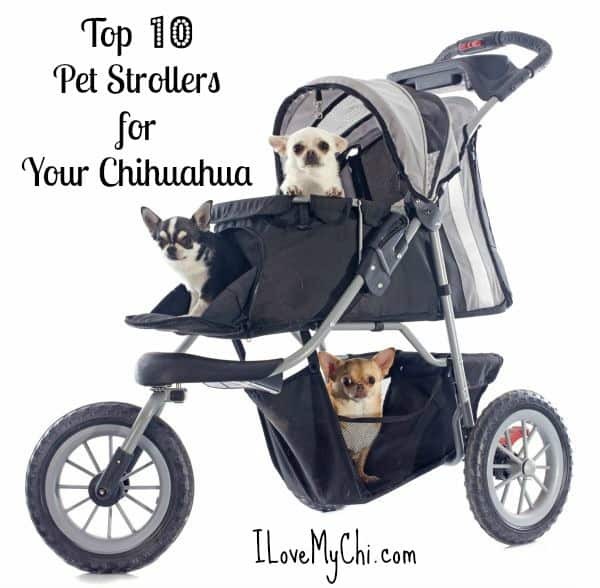 what is the jogging stroller (gray & black) with the 3 chi’s in it above your choice #1? No that’s just a cute photo I had. For me personally, I ordered #1 and like it so far. But if I had the money, I’d buy #10. I am ordering #7 off of a website and im very excited for it to come. It looked like a good buy and said that it was the best seller for dog strollers. It helped me to know that it was on the top 10! Let us know how you like it Yolanda. I have been looking at strollers till my eyes hurt :-). Yes I did purchase #1 and I use it once or twice a week, usually just to walk my chi in the neighborhood. So far, I haven’t had any problems with it. We don’t have as much rain as you do but it is quite humid here most of the year and so far, no rust. I wonder if those people who had problems with rusting left the stroller outside or in a garage? That might cause rust in a rainy climate. All of the strollers on this page are good options and I think you would be happy with any of them. I only have personal experience with the first one though. 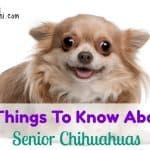 Hi, I stumbled across your site here and fell in love with the Stroller at the very top of the page with the 3 Chihuahua’s in it but I do not see that stroller in the feed that you posted. Do you know that make and model of that Stroller? Sorry Diane, I don’t. It was just a stock photo I bought. I wish I did know because I really like it too.